Junior Finance Minister, Jaipaul Sharma is to be taken before the Parliamentary Committee of Privileges by the Peoples Progressive Party (PPP/C) for what that party calls statements that were untruthful. Opposition Leader Bharat Jagdeo said it was Sharma who mentioned that $55B in tax remission was ‘given’ to friends and family of the PPP/C. 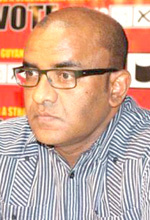 Making reference to an extract from the last budget presentation, Jagdeo outlined how the tax remissions were awarded. He was furious that though this was mentioned in the budget speech Sharma accused his party of skullduggery. It was noted that in 2015 there was $47B in tax remission and that was given to hospitals, companies and businesses, churches and charitable organizations, public officials, ministries and government departments, remigrants, diplomats and foreign funded projects. Jagdeo said that it was these organizations that benefitted from the remissions. The two times former President said he found it egregious that a Minister of Government could make such utterances and nothing should be done. He mentioned that the tax remissions have been reducing, under the current administration, in all areas except Ministries and Government Departments. Jagdeo said that tax remissions in this area have increased from $2.9B in 2015 to $4.3B in 2016; and wonders who is now giving to friends and family. He said that he finds that move very odd, since tax breaks to businesses were reduced and wonders how this can be good for business. He also noted that this move will only bring undue hardship to the business community. The former President said that he wanted to make clear that his administration did not give $55B in tax remission to friends and family of the PPP. Jagdeo said that the opposition will be moving forward to bring charges in the parliamentary court against Sharma at the earliest possible time.